As Hurricane Florence pummels the south and east coast this weekend, healthcare providers will turn to health information exchanges to get patient data. These aggregation services have been preparing in advance to fill in gaps that arise when patients see providers they don't usually go to or when providers' electronic health record systems go offline. Just as it's crucial during fair weather for providers to have access to patient data, so it is when natural disasters strike. But because people are often displaced during disasters, it can be tough to get that data at provider sites that patients are new to. "HIEs are charged with making sure that information is available so physicians can provide safe and informed care," said Jay Nakashima, vice president of eHealth Exchange, the country's largest HIEs. "These patients are away from home, and it's critical physicians know their allergies, their precise medications, and their comorbidities before they deliver treatment." To prepare for Hurricane Florence, the eHealth Exchange has been making sure that providers that aren't yet linked to HIEs are getting connected. They've also been helping to connect HIEs in the affected region and surrounding areas. For instance, the North Carolina Health Information Exchange Authority and the Georgia Regional Academic Community Health Exchange drew on the Sequoia Project's eHealth Exchange to form a last-minute connection this week, said Christie Burns, executive director of the North Carolina Information Exchange Authority. "An HIE becomes a critical utility during disasters," she said. The North Carolina exchange also has connections with other nearby HIEs. GRAChiE, for its part, wanted to get out ahead of the storm. With Hurricane Irma, it was late to the game. "We were standing up emergent connections on our own, because people had already evacuated," said Tara Cramer, executive director of GRAChiE. GRAChiE also this week linked up with Atrium Health CareConnect, the HIE run by Atrium Health, doing in a matter of days what usually takes weeks or even months, according to Jonathan Sherman, director of the HIE. "That's a big win for us, because if any evacuees come toward us, we've got additional coverage," he said. So, for example, if a patient has to leave one of those connected states and ends up in the other, a provider organization can tap into the patient's home-state HIE. After the provider queries the HIE for information about the patient and the HIE runs patient-identification tools to make sure it's pulling up the right record, the HIE will then send over the information, often bundling it up into a single document. For this kind of exchange to work, organizations must be well prepared, said Chuck Christian, vice president of technology and engagement for the Indiana Health Information Exchange. "Particularly in this event, when they know it's going to be an issue, organizations can make preparations for how they're going to do it rather than waiting for something to occur," he said. 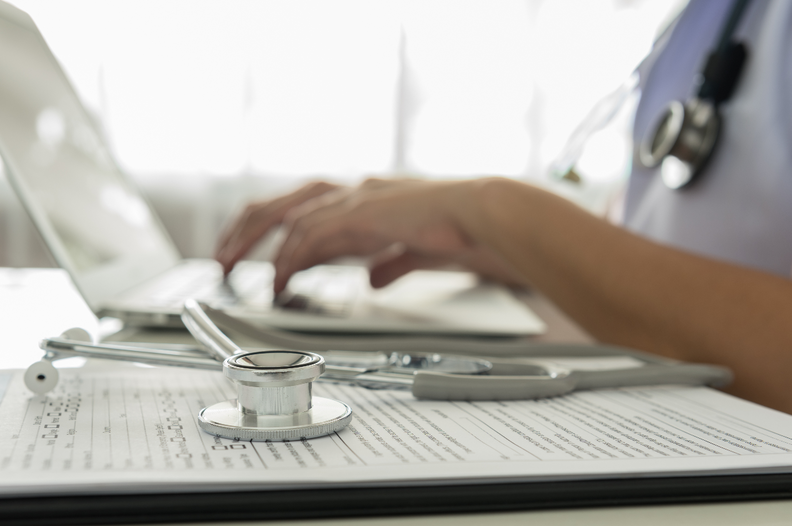 His HIE and others have formally documented for their provider organization members how they can access records if there's unexpected downtime. This is a far cry from how things were in 2005 when Hurricane Katrina hit. Then, only about a quarter of clinicians in the U.S. used electronic health records. Providers in areas where patients were evacuated to often didn't have access to patients' paper records. Even when patients stayed put, there was trouble, since many records were lost in the storm. Since then, a lot has changed. Now, more than three-quarters of U.S. clinicians have EHRs. And because many of those EHRs are from the same vendors, interoperability is built in. Even when providers are on different systems, software may allow for some degree of interoperability. But when those EHRs are unavailable, when access hasn't been authorized, or when interoperability links are insufficient, health systems can also pull patient information from health information exchanges. Though these interconnected systems have been somewhat slow to catch on, hindered by troubled business models, they've been taking off lately. A platform designed specifically for disasters, the Patient Unified Lookup System for Emergencies (PULSE) gives providers access to the records of patients who have evacuated their homes during disasters. The platform was originally developed by Audacious Inquiry, a Baltimore-based health information exchange technology firm. In 2017 and 2018, providers used PULSE during the California wildfires, connected to Sequoia Project's national network. Currently, Audacious Inquiry is partnered with the Sequoia Project to scale PULSE as a nationwide disaster response solution. HIEs aren't without their limitations, though. "The primary limitation is that of power and internet," said Dawn Paulson, informatics director for the American Health Information Management Association. "In those cases, healthcare organizations will revert to the downtime processes of documenting on paper and do not have an option of obtaining outside records from an HIE or other healthcare organization." Another limitation is cost: Hospitals don't always want to spend the money up front to get connected to HIEs. Even when they do, HIEs can have limited functionality, with information sometimes incapable of traveling back to patients' home organizations. Some HIEs offer read-only access to data, which means that when patients receive care elsewhere, providers must manually upload records of that care back into patients' home EHRs. In some cases, HIEs choose to offer read-only access during disasters. When HealthlinkNY, for instance, set up at a shelter in Binghamton after Hurricane Irene in 2011, clinicians were able to look up their patients' existing health status and medications. Clinicians then relied on paper to make notes of each patient encounter. But, noted Staci Romeo, executive director of the HIE, "the gold standard is a bidirectional connection." Some think part of the solution is giving people access to their own health data. That's already the way things are moving generally, both in the private sector and government. Apple now lets patients of certain provider organizations aggregate their EHR information on their phones, and the CMS intends to give patients more control over their health data through the MyHealthEData initiative. By using these tools, patients can share their health data with whomever they want—which would go a long way in a disaster, when they're displaced. But those methods also pose challenges. "We need to have good mechanisms in place to make sure that the person telling us the information is actually the patient and whoever is making the request has been authorized by the patient," Christian said. "There's standards and mechanisms that need to be put in place on both ends to make sure of the integrity of the data and the authenticity of the request." Clarification: This story has been updated to clarify HealthlinkNY's functionality and the proper developer of PULSE.